This Aspatore legal title provides a solid foundation for understanding and communicating effectively with your attorney and other professional advisors regarding how to set up a winning business succession plan. 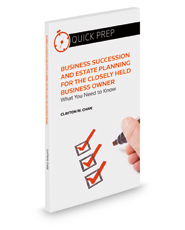 Although business succession and estate planning is often viewed as an arcane field, full of complex concepts and terminology, it is also essential for every closely held business owner. Neglecting this type of planning is to risk having your business and other assets pass in ways that you did not intend.